Samuel Metzger is available for concerts, hymn festivals, and masterclasses throughout the year. 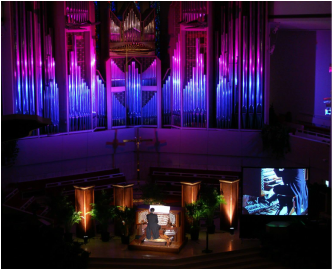 The concert program is chosen in consultation with the host church, and usually includes a variety of audience friendly classical and sacred repertoire. Mr. Metzger enjoys speaking throughout his concerts. Giving the history of a piece - perhaps an interesting anecdote about the composer - helps to make classical music more accessible to the general public. Though not required, the use of a camera and video screen, is often an enjoyable addition for the audience. Samuel also enjoys collaborating on programs and is happy to work with soloists, instrumentalists and choirs if desired. For more information on availability and fees, please email: samuel@metzgermusic.com. Friday, September 18, 2015 at 7 p.m.
Sunday, September 27, 2015 at 6 p.m.
Friday, October 9, 2015 at 7 p.m.
January 22, 2016 at 7 p.m.
Friday, February 26, 2016 at 7 p.m.
Sunday, April 9, 2016 at 7 p.m.